This is a pretty groundbreaking post in the book talk category - all of these books were bought brand new. Very rarely do I ever buy new books, but in my defense, I didn't pay retail for any of these. I've been reading like crazy this year so my interest in books has been renewed. I picked up If the Allies had Fallen on a whim while browsing Barnes & Noble. They usually have a great selection of WWII books in their bargain section. That same trip I picked up Matt Bellassai's Everything is Awful, which I'd been pining over since I started listening to his podcast. I scored it for half off since it had just left the new release table. Leah Remini's Troublemaker was an order from Books-a-Million with a gift card from Christmas. I've always been morbidly interested in Scientology and I've wanted to get my hands on this for a long time since I'm a big fan of Remini. How Not to Kill Your Houseplants was an Amazon purchase since the reviews were good and I've recently really gotten into houseplants. Lastly, K picked me up Gizelle's Bucket List by Lauren Fern Watt from the airport one night when I was on my way to get him. (What's better than a man that buys you books?? Nothing.) It's almost guaranteed to make me cry, but it looks really good! And there we go! I'm super excited to get started on all of these. If you haven't already, add me as a friend on Goodreads! I love seeing what other folks are reading. One evening I was wandering through Dollar General pickup up bleach and sandwich bags and light bulbs when I noticed a book with a cute little pupper on the cover. Upon closer inspection, it was this book that's been on my Amazon Wishlist for forever. Then, on the same shelf six inches away, I found Mariano Rivera's book! Ahh!! As a huge Yankees and Rivera fan, I immediately grabbed this one. It's currently selling on Amazon for $20. Both books were $3 each, a pretty good deal. You never know where you'll find books! Lately, I've been doing pretty good with the whole "for the LOVE OF GOD stop buying BOOKS" thing. Honestly, being a member of huge library system really helps. Instead of spending a dollar or two on books, I can just open up the library system's app and see if they have a copy. That said, clearly, my willpower was on vacation today when I went thrifting. But that's okay, we all make mistakes. I hadn't intended to even look at the books, but my best friend and thrifting partner wasn't with me so I mosied on over and picked up Burnt Toast by Teri Hatcher first, because I've been watching Desperate Housewives lately. I've really been getting into sci-fi lately, so I snagged At Winter's End, which has many pages and very tiny font. I love a good thriller, so The Missing Girl was a random selection and The Plague Dogs, which sounds depressing, has been on my to-read list for a while now. I feel the need to explain Dark Places by Gillian Flynn a little. I absolutely did not like Gone Girl and I was not afraid to tell it. I thought it was written well but it was highly infuriating. However, I try not to let one book ruin my opinion of an author, so I picked this one up. I'm only 24 books into my 50 of the reading challenge, so I really need to start chugging away on some of these. These are all non-affiliate links from Thriftbooks, but if you'd like a discount just click here* and we both get one! I recently got a card (again) for a huge library system in the city I work in. It's a little easier to access than my county library and I was eligible for a card since I have one in a surrounding county. Well, I checked out their online catalog and holy cow. SO MANY TITLES. I'm ecstatic! I put a ton of hold and on my to hold later list, but this is my first haul. I've already finished one of these. Alllll of the graphic novels. They have such a selection and I'm trying a ton of new ones. I've already finished Rat Queens, which was amazing, and I'm going to start on The League of Extraordinary Gentlemen next. Y: The Last Man has been on my list for quite some time, and it comes highly praised, even by Stephen King. While I was browsing graphic novels, I stumbled upon The Hospital Suite and added it. Last but certainly not least, A BOOK ON BIGFOOT. I have so many books I already own and need to read that I tried to stick with graphic novels as they're quick to get through when I want to read but don't have time to sit down for hours like I'd like. Luckily I have a few people to pass my books onto when I'm finished, so hopefully that motivates me to knock out my TBR list. As usual, all links are Thriftbooks and not affiliate, but use this link* for 15% off and I get a discount, too! Well, I bought my first Agatha Christie novel, Sleeping Murder, which is coincidentally her last. I picked it up at the thrift store for a mere buck. Along with that, I grabbed Stephen King's The Green Mile and Hitchcock's Stories to be Read with the Door Locked. And in my ever growing pile of nutrition reads, I've added What to Eat by Marion Nestle, which is from 2006 but still looks really interesting. Did I need more books? Absolutely not. But I finally finished Haunted by Palahniuk (which I'm not so sure I liked), so I treated myself to a few cheap thrift store goodies. I finished up a couple smaller eBooks, too, which can be found on my Goodreads page. I've been toying with the idea of rereading the Harry Potter series again for the 19th (probably no exaggeration) time, but I haven't decided if I want to do that or knock out some more of my TBR pile. I really need to downsize this massive collection of books I have if I want to move at any point in the next year. On the way out to Tennessee, I realized I'd forgotten to bring my book to read. A bookworm's worst nightmare! Luckily for me, my favorite secondhand bookstore was having a half off sale so I ran down and snagged a few books. For ten dollars, I got all of these! Candles Burning was completed by Tabitha King after Michael McDowell passed away and I was excited to spot it, as it will be my first T. King novel. 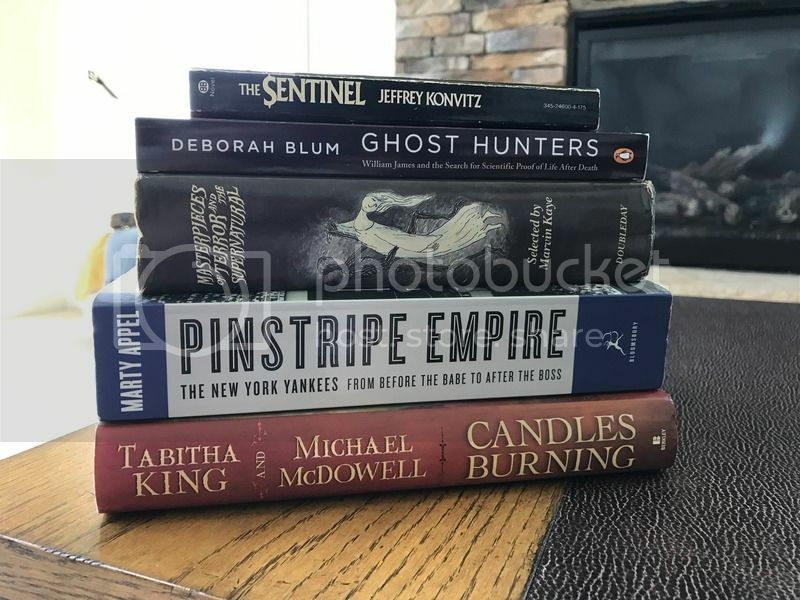 As a Yankees fan, I quickly grabbed Pinstripe Empire and added it to my pile, and ever the horror fan, I picked up Masterpieces of Terror and the Supernatural, along with The Sentinel, which has been on my TBR for a while now. Ghost Hunters seems like it'll be a nice read and I'm always interested in the paranormal. If you're interested in any of the above titles, get them secondhand via Thriftbooks with this link* and we'll both get 15% off! I continually moan and groan about how large my To Be Read pile has gotten, but I repeatedly scope the books out every time I got to a thrift store. I've gotten better about only picking up books I really want or I've been looking for, though. I snagged these two books for $1.49 each! 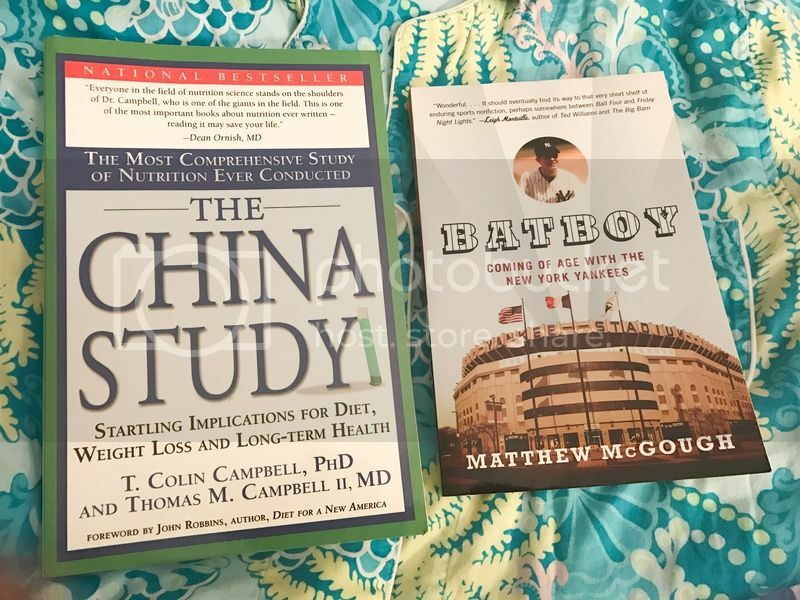 A couple years ago I gave my mom a copy of The China Study* and I've been wanting to read it ever since. Now I can! And of course, as a Yankees and memoir fan, I had to pick up Bat Boy*. These haven't been started yet as I'm still working my way through Haunted* (that's a slow go) and I started Gathering Blue by Lois Lowry, too. 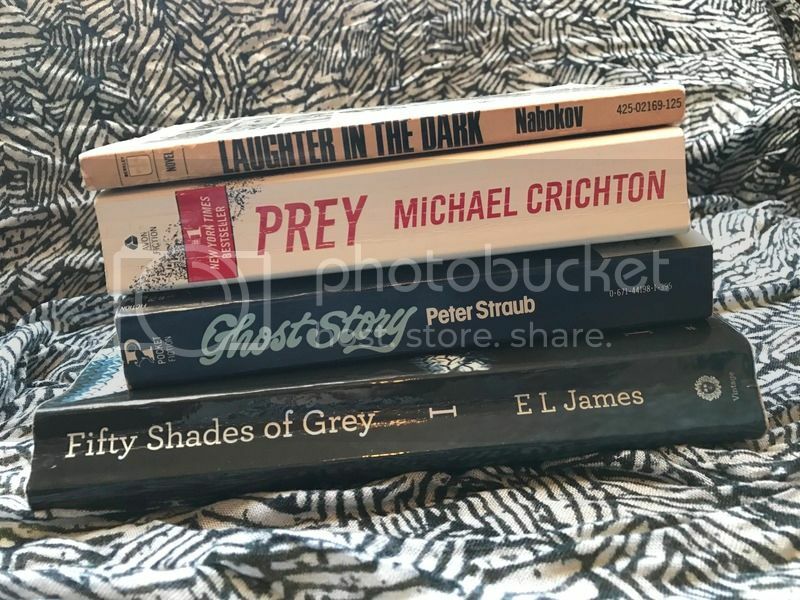 I linked all of these to Amazon, but if you don't mind secondhand books and want a discount, check them out on Thriftbooks* and get 15% off! When I took a trip up to see Jess, we stopped by McKay Used Books and I grabbed some titles. Here they are! I've been really slacking on my reading lately, and with so many books on my reading list, I've only managed to skim Destiny Turns the Wheel. 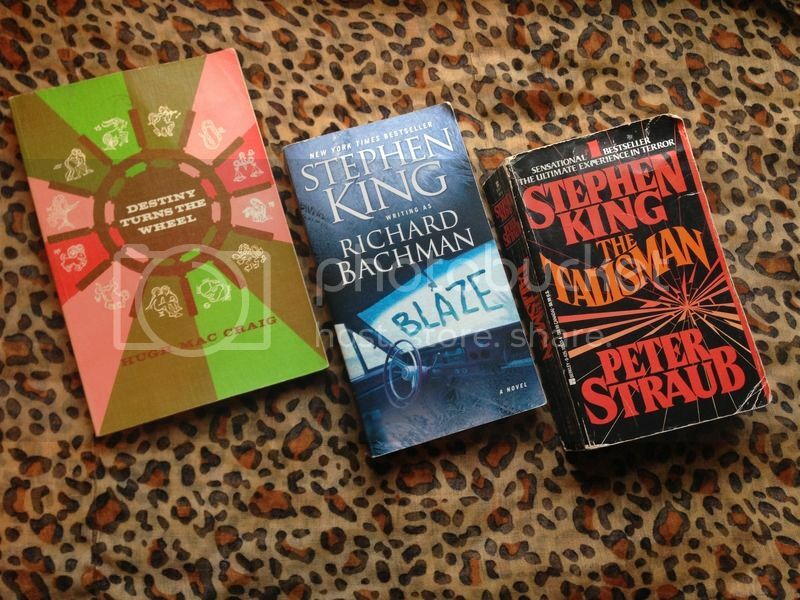 I hadn't seen Blaze in stores before, so I snagged that and The Talisman. I've read Black House and was a little lost, so I'm excited to read this one and be filled in. Add me as a friend on Goodreads! I love seeing what everyone is reading. I've always been a sucker for books. I read constantly - it's my way of beating anxiety and relaxing. Bored? Read a book. Worried about something you have no control over? Read a book. The list goes on. I found these pictured at Goodwill. I think I'm most excited about Dolly's! I picked up Pride and Prejudice because, honestly, I've never really read any of the "classics". Yeah, pretty terrible. I really loved The Secret Life of Bees by Sue Monk Kidd, so I grabbed The Mermaid Chair in the hopes that it's just as good. And, of course, I'm a sucker for all things animals, especially dogs. Do you have any favorite thrifted books?